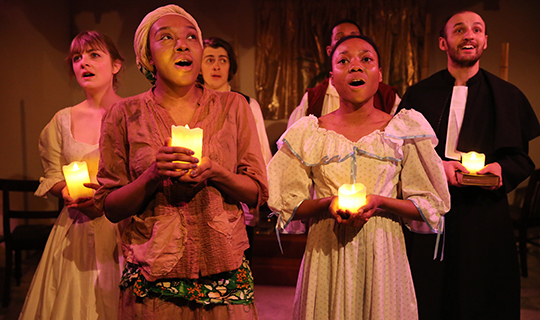 Muscovado is BurntOut Theatre’s scorching new play about slavery in Nineteenth Century Barbados. A heady mix of sexual intrigue, piercing choral music and extreme racial tension, Muscovado provides an unflinching portrayal of life on a sugar plantation in 1808, accompanied by an original musical score and atmospheric soundscape performed live by the cast. Having already had a sell-out run in London during Black History Month in 2014 BurntOut Theatre’s original production by promising playwright Matilda Ibini. ‘Muscovado’ will be touring several cities around the UK in 2015. BurntOut Theatre commissioned ‘Muscovado’ following the discovery of archives from Barbados of Artistic Director Clemmie Reynolds’ family.